With the Eibach Pro-Spacer installed, the car looks wider and better, as the wheel fills the arch. Thats how the cars look gets its final touch. 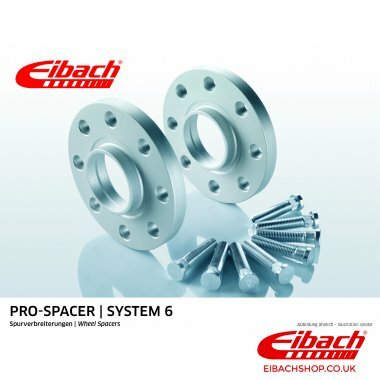 Optimize the "sportive touch" to the last detail: wheels, tires, Eibach Suspension Components and Pro-Spacer! You'll achieve optimum looksand enhanced handlingby moving your wheels flush with the outer edges of the wheel wells. Simply measure the wheel-well/tyre gap, as shown here, and order the corresponding Pro-Spacers to put your wheels and tyres out where they belong. Andrew Coleman Fitted these to the front of my nissan 350z, (20mm on rear). Very impressed with the quality, fills arches with wheel now and the spacer is same dia as the Rays wheel so also looks good. Order arrived earlier than expected too. Andrew Coleman Have fitted these to the rear of nissan 350z, very impressed with the quality and how easy they were to fit. They look great on the car as the they match the dia of the hub of the standard Rays wheel, also with the spacer the look of the car is greatly improved filling the arches with wheel now. Tony Quality product, very well made and not too heavy. Fits perfectly on the rear track of my Honda CRZ, with factory 17" wheels - fills the arches nicely! Great service, communications and prompt delivery from Eibachshop.co.uk. Order to UK Highlands & Northern Ireland is £12.00 and will be shipped to you via DPD couriers on a 2 day service.